March 28, 2017 | By Amy Occhipinti, M.S. Whether you're an avid spinner, or you're in the market for a new career path, one of the most desirable aspects of becoming a fitness instructor is the ability to focus each day on helping your clients meet their health and fitness goals (and of course, having fun in the process!). So what's the recipe for delivering an unparalleled indoor cycling experience? Let's start with the basics—what you need in order to get certified. 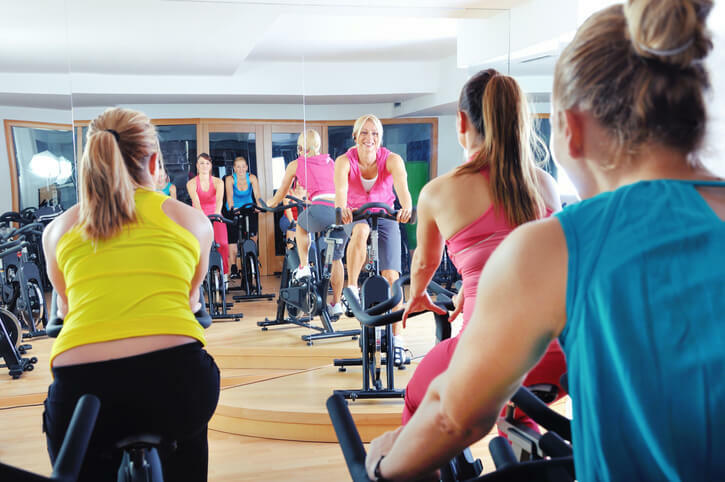 Before you can become a spin instructor, you will need to obtain a cycle instructor certification through an accredited program. When selecting a program, you will want to look for a certification course that covers various cycling programs and techniques. It's also important to look for a course that can help you create a class that accommodates all levels of endurance, speed and strength, along with choreography techniques, studio setup and design. In order to meet your requirements, you'll also be required to enroll in a CPR training and certification course to ensure that you have the skills to effectively manage and tend to any situation that may occur while you're teaching. While spinning is a safe, and typically low-impact workout, it still challenges the body and can post more of a challenge for some. Now that you have successfully acquired the necessary certifications to get started on your fitness venture, you'll want to also ensure that you are well-versed in the setup of the indoor cycling bikes. Your students, especially beginners, may ask you for help setting up their bikes and as an instructor it's your responsibility to make sure that they are comfortable and stay safe during each class. Successful instructors always plan their classes in advance. If your schedule allows, test your class for quality assurance. When you're planning out your class, don't forget to include a warm up and cool down period with stretching. An effective and efficient spin class puts things into full gear with a high-energy mix of music. Be sure to include different genres. While some of your students may enjoy riding to electronic (EDM), some of your other students may prefer 80's rock - by including variety in your music, you can ensure that your classes offer something for everyone. Whether you're instructing at a SoulCycle studio or a local studio, you'll have options for a different atmosphere (think dimmed lights and techno) so be sure to mix up your classes so you can expand your reach and attract a variety of students. We all make mistakes, but if you knew how to avoid them, wouldn't you be much more likely to set yourself up for success? Well, of course! Brush up on your knowledge for a successful ride. Mistake #1: A lack of knowledge or experience: Successful instructors take the time to memorize and practice proper form and positioning to ensure that every ride is safe and effective. Mistake #2: Not allocating enough time for a cool-down period: Spin classes last anywhere from thirty to sixty minutes, so schedule a cool-down period for roughly three to four minutes depending on the intensity of the workout. Don't forget to stretch before and after each ride. This will encourage good habits and even benefit your own physical state in the short and long term. Mistake #3: Mistaking beginners for advanced riders: It's easy to get caught up in the ride, but let's not forget to recognize and welcome first-timers! Some of your students may be shy or intimidated by a new class environment, so be sure to make sure everyone is set up properly and ready to go. Studios and fitness centers are looking for well-rounded certified professionals that follow a safe and effective cycle class design. Take the time to continue evolving your education and stay informed. Although there are many programs to choose from, ultimately decide on a program that aligns with your needs, goals and can provide you with the credibility you need to help others achieve their fitness goals. Editor’s Note: This post was originally published in January 2015 and has been revamped and updated for comprehensiveness.